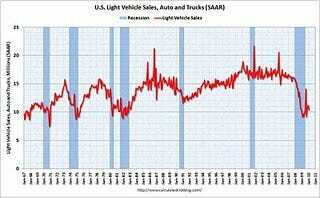 This graph shows the historical light vehicle sales (seasonally adjusted annual rate) from the BEA (blue) and an estimate for February (red, light vehicle sales of 10.4 million SAAR from AutoData Corp). This is a 3.5% decline from the January sales rate. 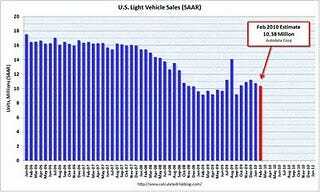 This is the lowest level since September – when sales fell sharply after the “Cash-for-clunkers” program ended in August. The current level of sales are very low, and are still below the lowest point for the ’90/’91 recession (even with a larger population). Right now it looks like both seasonally adjusted auto sales and residential investment will be lower in Q1 than in Q4 2009.